My sister-in-law has been kind enough to share some of her recipes with me. I am learning new recipes from her like her mom’s special Crab Masala. 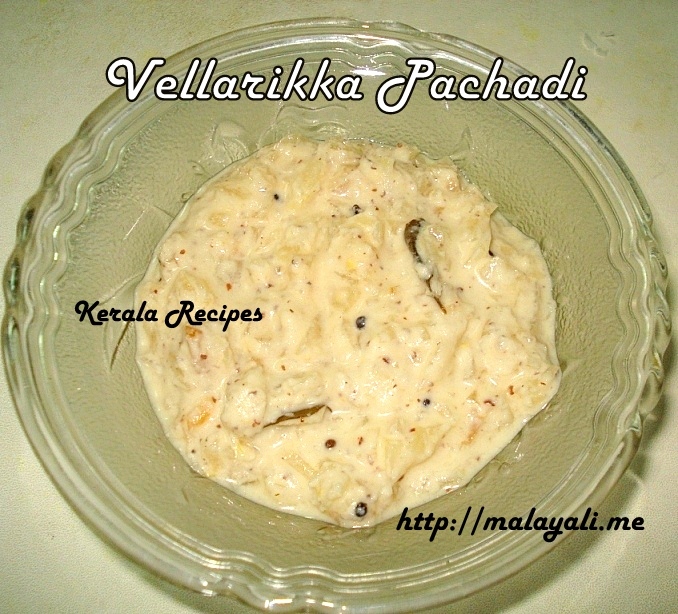 Here is her recipe for Vellarikka Pachadi. Vellarikka (Sambar Cucumber) is often used in South India for making Sambar, Pachadi and other dishes. It is Greenish-Yellow in Color and is often round in shape. It is very different from the slender, green salad or pickle cucumbers. Here in US, I have seen Sambar Cucumber only in Indian Grocery stores. I had prepared Pineapple Pachadi and Nendhra Pazham Pachadi for Onam. I need to prepare Vellarikka Pachadi this time. Peel the skin form the Cucumber and discard the seeds. Chop it into small cubes. Add salt, slit green chillies and little water to the cucumber pieces. Cover and cook on medium heat until the cucumber pieces are tender. Most of the water would have evaporated. If not, drain any excess water. Keep aside. Meanwhile, grind together grated coconut, green chillies and mustard seeds with very little water to form a smooth paste. Add this ground coconut mixture to the cucumber and cook for 3-4 minutes. Add salt to taste. Reduce heat and add beaten curd and mix well. Remove from heat. In another pan, heat 1 tbsp coconut oil and splutter mustard seeds. Add curry leaves and saute for a minute. Pour the seasoning over the pachadi.